It has been a busy couple weeks, with projects on top of projects keeping my students busy. They are building things for the Google Global Science Fair, conducting experiments for class and — most of all — working on the Group 4 Project [G4P]. The G4P is signature IB : interdisciplinary, international, and student-driven. We have groups of three designing and carrying out labs related to the theme of Energy. That means photosynthesis, yeast metabolism, calorimetry, and more. My Bio/Chem colleague and I have been discussing lately the complex balance required to (a) set up students with good investigations that will feasibly work, while also (b) allowing them the freedom to design and make their own decisions. For the science fair, the balance is heavily toward (b), but for the G4P, we tend to include some (a). In two cases we provided the skeleton of a lab to groups after their own attempt fell flat. Which brings me to birch trees. 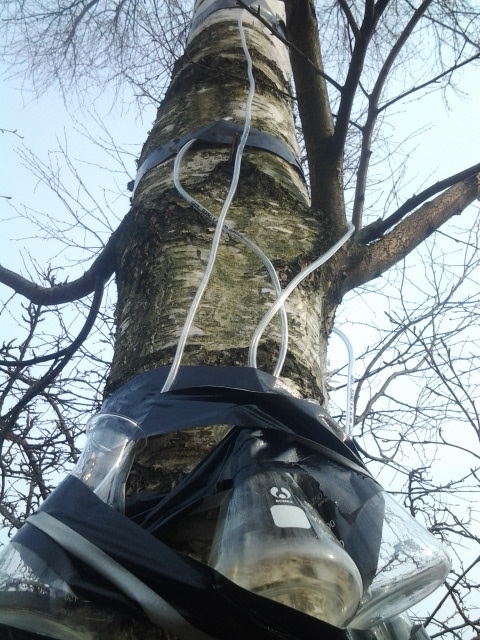 It is berzu sula time here in Latvia, and so we came up with an experiment involving birch trees and negative pressures. I can’t wait to see what the students come up with. This entry was posted in Uncategorized and tagged berzu sula, group4project, projects on March 26, 2015 by Danny. I picked up a bunch of rocket motors two years ago, but unfortunately my model rocket got lost during a winter launch last year. When a coworker asked me to do a rocket launch with a second-grade class, I knew I would need to improvise. The motors are B8-3s, which means they have a decent kick for their small size. 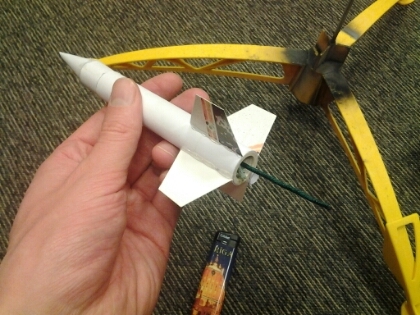 I rolled some paper around couple motors to make a body, then made the cone (roll up a half-circle) and glued on some fins and a little tube for the rod of my launch pad. A small square of paper towel serves as wadding, and a strip of shopping bag will slow the descent after the ejection charge pops off the nosecone. The fuses don’t fit very well, so I get plenty of misfires. On my second attempt, the rocket launched. The nosecone fell off and the rocket’s launch was unsteady, but otherwise uneventful. I wasn’t able to retrieve the body to see what sort of damage it sustained. The major flaw with this design is the instability of weight distribution. The center of mass — essentially the motor — is too far down the tube, which means a small wobble gets amplified because the nose wobbles more than the bottom. I will attempt to fix this by adding a small amount of mass to the nose. 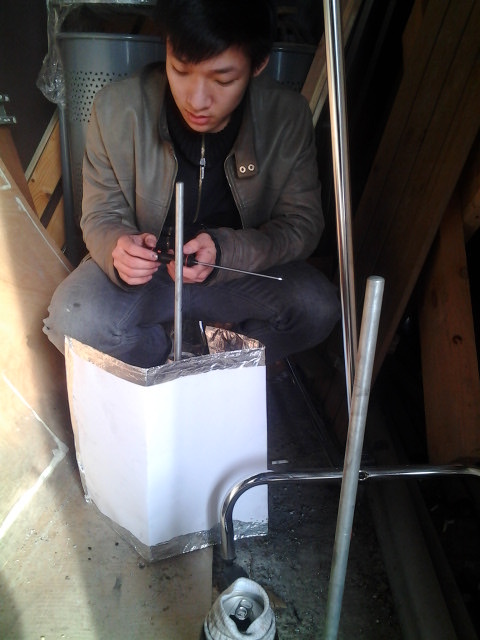 This entry was posted in Uncategorized and tagged cheap physics, projects, rockets on November 10, 2014 by Danny. 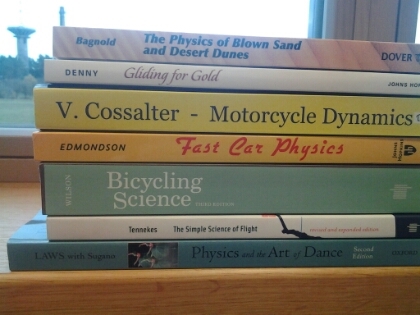 I have been collecting books that explore the physics of things. The aim is to have some references ready when my students start their individual projects (any maybe some extended essays) for the new IB physics curriculum. The Physics of Hockey, by Hache, is probably my favourite (I am Canadian, after all!) but a student has it at the moment so it didn’t make the photo. Several of these books are written at a level to be quite accessible to a high school student, while also doing a good job with calculations, graphs, and tables of data. I would like to write a book like this one day, but I don’t know what it would be about. This entry was posted in Uncategorized and tagged books, physics, physics of, projects on October 20, 2014 by Danny.